The fourth Littoral Combat Ship breaks down in 12 months. On August 29, the Independence-class Littoral Combat Ship (LCS) USS Coronado has suffered an engineering casualty en route to Singapore during a deployment with the U.S. Navy’s Seventh Fleet in the Western Pacific, USNI News reports. It is unclear when the USS Coronado will resume its deployment. “The extent of repairs and any operational impact is unknown at this time. An assessment of the casualty will be completed upon return to Pearl Harbor and additional details will be made available when possible,” the U.S. Navy states. This marks the fourth time that a LCS suffered a major incident over the last 12 months. The U.S. Navy revealed on August 28 that the lead ship of the Freedom-class LCS variant, the USS Freedom, is sidelined in San Diego after sustaining damage in one of its two main propulsion diesel engines on July 11—most likely due to a crew error. The Freedom-class LCS USS Forth Worth is at the moment also out of action after suffering damage to its propulsion system caused by a human error in January. The ship is currently in transit from Singapore (where it languished for seven months) to San Diego for major repairs. As a result of the operating error at the beginning of the year, the captain of the USS Fort Worth was relieved of duty. 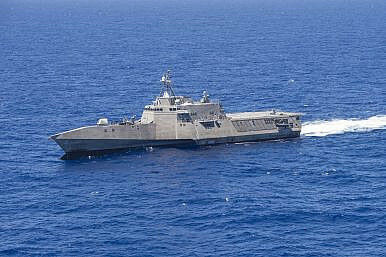 The ship was the second LCS ever to be deployed to the Asia-Pacific region. Furthermore, in December 2015, the Freedom-class USS Milwaukee sustained a combining gear casualty about 64 kilometers (40 miles) off the Virginia coast during an Atlantic transit. The problem was traced back to a software issue, which caused a clutch not to disengage when the ship was switching engines, and not human error. Lockheed Martin fixed the issue by installing new software patches. The ship returned to active duty in June. The most recent casualty, the USS Coronado, participated in this year’s Rim of the Pacific naval exercise, using the ship’s General Electric LM 2500 gas turbines rather than its MTU main propulsion diesel engines. During the naval drill, the ship conducted a live fire test of a Harpoon Block 1C missile aboard the vessel with mixed results (See: “RIMPAC 2016: US Navy Test-Fires Anti-Ship Missile From Littoral Combat Ship”). It is also the first LCS to be armed with an advanced anti-ship missile. As I reported previously, the ship is currently being fitted with a RGM-84D Harpoon Block 1C missile system in Pearl Harbor, Hawaii. The LCS review was ordered by Chief of Naval Operations Admiral John Richardson in early 2016. The newly built warship sustained a total of three unrelated casualties since its commissioning in September.